The dotted lines in the map show the wheelchair accessible routes. There are two special needs parking areas, they are located in the main parking lot on the west side and near the Park Administration Office on the Suikei-en (Japanese Garden) side of the park. * Please click here for more information. 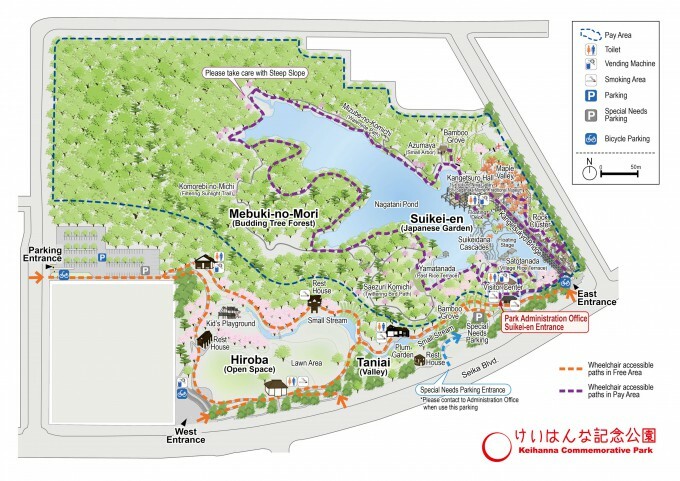 Three wheelchairs are available on a first-come-first-served basis at the entrance of Suikei-en (Japanese Garden). For inquiries, please contact the Park Administration Office. There are five restrooms for those with special needs, located near the main parking area, the Lawn Area, the Taniai (Valley), in the Visitor Center (BF), and in the Kangetsuro Hall (1F).